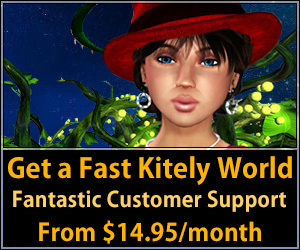 Earlier this year, Linden Lab released Second Life Viewer 2 which, though it had a large number of usability problems, also offered one huge advantage for business and education users: the ability to put a live webpage or any other media onto any in-world surface. This means that a group of employees can sit around one common screen and browse the Web — just as if they were gathered around a single computer. They can even enter data into a Web page, or collaborate on Google spreadsheets or text documents or presentations. This feature is called media-on-a-prim and, for the first time ever, I wanted an office in Second Life. (We have one now, on Troppo Island, thanks to Per Erickson of Troppo Design, who also has a very impressive OpenSim grid that’s well worth visiting if you’re touring the hypergrid, at Troppogrid.com:9000.) We’ve used the office to on-board new interns, showing them around company websites and our online workflow platform. 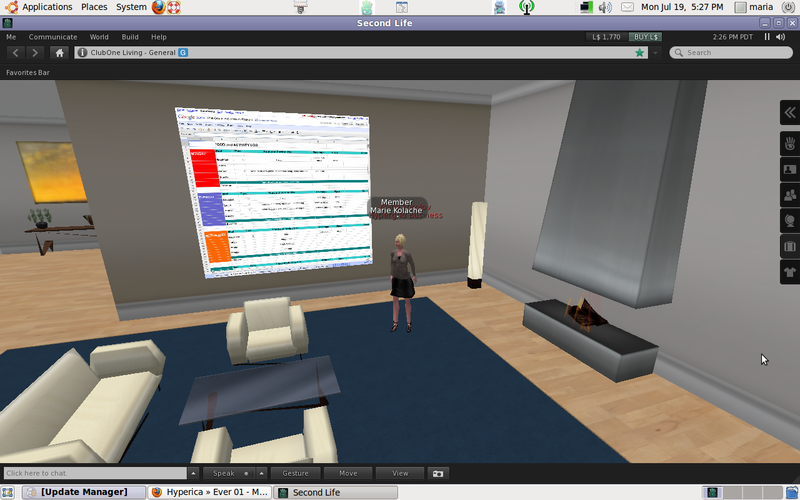 A Google spreadsheet on a screen in Second Life. And we asked OpenSim core developers when OpenSim would be compatible with the new viewer. The answer was: someday soon, but a major re-architecting effort has to be finished first. (See full article here.) That project is now complete — and developers have time for Second Life Viewer 2 support and media-on-a-prim. In fact, the main challenge isn’t media-on-a-prim at all. The one limitation of media-on-a-prim for business use is that it’s currently impossible to share logins. For example, if the boss is looking over the shoulder of his employees in real life, he can see what they’re working on. But if he looks over their shoulders in Second Life, and the online application they’re using requires a login, he will only see the welcome login screen. Even if he then logs in, he will be in his own session of the application, not sharing a session with the employee. Obviously, someone giving a sensitive financial presentation doesn’t want strangers to zoom in with their virtual cameras and find out company secrets. 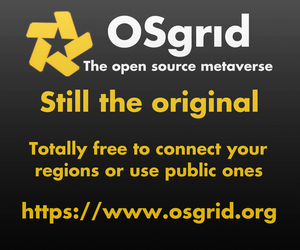 One possible solution would be to create a way to give meeting attendees temporary view-only or full-edit access to shared media while they are in the same region as the avatar giving the presentation. As soon as either of the two leaves, the one-time access rights would end. This is the way that the business-friendly Teleplace virtual world platform currently handles shared document permissions. Today, shared collaboration is only possible in Second Life with publicly-accessible documents — no logins required. This would still be a step in a good direction, but shared login sessions would be even better. Unfortunately, this part isn’t up to the OpenSim developers, since most of this functionality would reside in the viewer.